Do the Squat and Deadlift Improve Sprinting Speed? Based on the evidence, both in the real world and from research settings the consensus is pretty obvious that both the squat and deadlift help us run faster. Do the squat and dead lift improve sprinting speed? Since I first entered into the speed training realm, there has always been some degree of debate amongst many professionals concerning whether or not the squat and or deadlift was necessary for increasing human running speed. In this article we will explore several studies and sub-topics and find out whether or not this type of exercise is indeed essential for a sprinter or athlete. Before I go on though, I want to be clear that I’m not advocating either of these 2 specific exercises as the be all end all to speed training, as there are several other elements that need to be a part of an athlete’s program in order to yield maximal benefit from training. However, based on the evidence, both in the real world and from research settings the consensus is pretty obvious that both the squat and deadlift help us run faster. Look at several high levels coaches throughout the field and throughout history (i.e. Charlie Francis) and you will notice that they opted to integrate heavy lower body strength training at precise times throughout the annual training plan to improve performance to the highest degree possible. Right now I want to review a handful of studies that I located on the topic. The first study comes from Wisloff in 2004 on a large group of elite soccer players. Please note, that about half of the research that I’m going to disclose to you references primarily team sport athletes. At the end of the article I’ll show you why this information is still very valuable and practical for sprinters, so just stay with me. What Wisloff found was that half-strength squat performance correlated very strongly with vertical jump height and 40 yard dash performance. The next study I found is compliments of a researcher by the name of Young from the Strength and Conditioning Journal. Young was able to determine that relative strength (strength to bodyweight ratio) levels and quadricep development were key regulators of short sprint ability, while glute and hamstring strength along with reactive strength (force production with motion present) were largely responsible for maximum speed capacity. Obviously, both the squat and deadlift are great training means for satisfying the initial training qualities mentioned in this particular study. Moreover, in 1999 there was another study from Mcbride that assessed the power outputs through various exercise tests for an elite group of powerlifters, olympic lifters, and sprinters. Power to bodyweight ratio scores were the highest in sprinters, with olympic lifters coming in a close second. What may be surprising to some though is that the average strength to bodyweight ratio for the sprinting group was 2.5 times their own bodyweight! The next study comes from Mann and his team who filmed several male and female sprinters in competition. What they found through a thorough mechanical assessment was that strength acquisition and technical proficiency were 2 essential qualities that the better sprinters possessed. Finally, I was able to locate 4 more studies and a credible online scientific review from Bret Contreras which indicated that either relative strength, concentric half squat strength, and or leg stiffness showed a strong relationship with either 40 yard or 100 meter dash performances. I should also mention that there is pretty split debate it seems on whether or not general strength or specific strength is necessary for advanced level sprinters. Everywhere I read and researched agreed that building a solid base of maximum strength will help out any novice or intermediate level sprinter, but it’s not entirely clear whether or not building a ridiculous squat or deadlift will improve an elite runner. Here is something to consider though for elite athletes. There is absolutely no doubt that with very low ground contact times exhibited by elite sprinters much of what is acquired under or over a heavy bar in the weight room will not transfer onto the track in terms of absolute force production, unfortunately. But with the margin of skill sharing an inverse relationship with the level of sprinter, every little bit will count in the long run, and why not put yourself or an athlete you train in the best position to excel? Moreover, every study showed the value of building a heavy squat or deadlift and the positive effects it had on the quadriceps, vertical force production, and acceleration levels which are important for all sprinters and athletes. I’m sure there are several advanced level sprinters and coaches who still undermine the value this type of training has to offer because there guys or girls are currently good enough, or they are apprehensive for whatever reason, or ignorant, but it could be a game changer, especially in longer bodytypes. Another common issue I see relevant to this discussion is the over emphasis still placed on speed and special endurance work in many of the local track programs I see and the feedback we get from the sprinters who train with us. I’m not sure how this relates elsewhere on a national scale, but I figure it’s worth mentioning in case anyone else encounters the same thing I do on a regular basis. There is no doubt specific endurance training is essential to lowering times, and it’s arguably the least labor intensive and smartest approach for beginners and intermediates, but at some point there will need to be an equal focus on both general and specific strength development for further progress, facilitated recovery, and injury prevention purposes over the long-term. Lastly, although all of the force gained in the weight room will not directly carryover in practice and competition, there still may be much benefit to be had physiologically. There are several local adaptations that occur in the presence of heavy strength work in the form of squatting and deadlifting that should not be overlooked by the track and field population. For example, increased motor unit recruitment/synchronization, local hypertrophy, and fast twitch fiber conversion to name a few. All of which could lead to greater power and rate of force development when the time comes. In other words, strength work could prime and potentially enhance what speed training delivers for the athlete. What is Contrast Training? How can it help sprinters develop more speed? Before I dive into the details for why sprinters and athletes should utilize this type of training, I’m going to first define what it is exactly. Contrast Training was first introduced to me by Louie Simmons at Westside Barbell. This type of training involves a “contrast” or some source of variable resistance as you perform an exercise throughout a range of motion. Bands and chains placed around the bar are the most common implements used to create this effect. Contrast Training addresses the concept of “Accommodating Resistance.” Due to changes in the detail of movement throughout an exercise, the degree of difficulty or level of resistance working against us changes automatically. I’m sure many are probably familiar with what I’m talking about. Take the back squat as an example. At the top it is easier to move the load versus the bottom of the movement. Bands and chains then ensure that you provide more resistance where the load is lower so you work harder and build strength throughout a full range of motion. This is one of the features of this style of training that I enjoy the most. Traditionally, sprinters and athletes have regularly utilized bounding variations and other types of plyometrics to really ingrain leg drive and propulsion which creates triple extension at the ankle, knee, and hip, among other things, and I view contrast training in the same light. It’s just another way of accomplishing this objective. Our neuromuscular system tends to relax and quit driving during a lift as we reach lockout, or extension in a lift. By adding a source of continuous overload via bands and chains, the muscles are forced to continue contracting harder and harder during the exercise, as we reach extension. Another benefit of working with bands and chains is that they require a sprinter or athlete to tighten up. Any subtle change in body position will cause the bands to react, or the chains to sway in all directions, and we have to instantly maintain control of the bar by creating tension and stability at our joints. I should note that even though bands and chains are generally implemented bilaterally off two legs or two arms, they can still be used unilaterally to really accentuate this effect like with sprinting. I still think bilateral work can have some carryover though. Control and preventing energy leaks during sprinting such as too much trunk rotation, or knee collapse is more common in beginner-intermediate level sprinters and can be remedied some with this approach, but there is still value to be had with contrast work for higher level athletes as well, which I will discuss shortly. The next element has to deal with our muscle’s natural stretch to strength ratio, referred to as “Length-Tension Relationship.” Quite simply, if we stretch a muscle too much it loses force potential and vice versa. Keep in mind that this can be overcome by neural processes, and I’m referring only to the muscle here. It’s understood that if a sprinter is too stiff when they land, then they will not rebound off of the ground and run as fast. On the contrary, too much bend or compliancy and speed is lost. There has to be a certain degree of pre-stretch to a muscle in order for it to act with more strength and power. Keeping this in mind, there then becomes a standard range of motion where our muscles act most explosively during each movement. The actual value that I located for this function is not practical and doesn’t make sense so I’m not going to reference it here. But if you learn to analyze joint angles of the lower extremities during athletic based movements such as sprinting, jumping, and cutting it would seem that a three quarter to half squat seems to be optimal for power. You can produce a high amount of force and express it fast at these points. Analyzing a squat and deadlift with contrast, you will notice that the resistance and overload is peaking or near it in these ranges of motion. Thus, you could argue that contrast training helps to optimize strength production in the ranges of motion that are common or specific to sprinting and other movements perhaps more so than straight weight alone. Of course there is a time issue here, but working in certain ranges of motion using partial rep exercises such as: pin presses, board presses, scap drills, bridging, etc. has been shown to help develop other movements, and contrast training shares similarities to partial rep drills because you are adding an extra load at specific ranges so it may work. Adding extra chains and bands to your max lifts does a great job at adding more total overload as well. Athletes will be able to lift more total weight with this approach, which will create specific neuromuscular adaptations or changes that are also partly responsible for becoming faster. For example, research has shown that strength training can induce both improved motor unit synchronization as well as rate coding. 3 4 Each of these adaptations that occur during high intensity resistance training can potentially make an athlete faster and are strongly encouraged with the use of bands and chains. The benefits to be had with contrast training heavily outweigh the negatives for sprinters and athletes. I should note that the studies referenced experienced trainees, so contrast training would definitely be a good addition for someone who has lifting experience already. Linear and basic strength training progression systems will work great for beginners and this approach is not a must at this stage of development. Exhaust the basics and then move to more advanced programming and techniques later on. So let’s review. Contrast training could help increase muscle activity levels according to emg reports which could affect sprinting performance, especially through the start and acceleration where knee angles and quad activity is higher. This increased production from your lower body musculature will help to groove triple extension and other speed characteristics. Control and stability are vital components that contrast training helps improve as well. There is greater overload seen while using bands and chains in comparison to straight weight, which could accentuate neuromuscular adaptations and changes in the body. Moreover, the overload will be provided at joint angles and phases of movement that are specific to the sprint pattern, and lastly, contrast has shown promise for developing power output which is a foundation for running speed. I could not locate any direct studies of this technique on sprinters or athletes, but I still think it is definitely worthwhile, nonetheless. I know it’s not specific, but neither is tempo work, active recovery, stretching, and other methods, and we all know they have confirmed value in a comprehensive speed training system. Complete Track and Field is a great resource for Track and Field Coaches to find tools to help them be successful in their profession. #2-Israetel MA, McBride JM. Kinetic and kinematic differences between squats performed with and without elastic bands. Journal of Strength and Conditioning Research 1: 190-194, 2010. #3-Rutherford, O.M., and D.A. Jones. The Role of Learning and Coordination in Strength Training. European Journal of Applied Physiology 55: 100-105, 1986. #4-Schmidt, RA. Motor Learning Performance. Champaign, IL. Human Kinetics, 1991. #6-Schoepe TC. Elastic band prediction equations for combined free-weight and elastic band bench presses and squats. Journal of Strength and Conditioning Research 1: 195-200, 2010. #7-Wallace, BJ. Effects of elastic bands on force and power characteristics during the back squat exercise. Journal of Strength and Conditioning Research 2: 268-272, 2006. #8-Baker, DG. Effect of kinetically altering a repetition via the use of chain resistance on velocity during the bench press. Journal of Strength and Conditioning Research 7: 1941-1946, 2009. What characteristics do the “Workhorse Sprinters” have in common? What kind of athlete can win you multiple events? Have you ever had an athlete or athletes that could win multiple events at a championship meet? 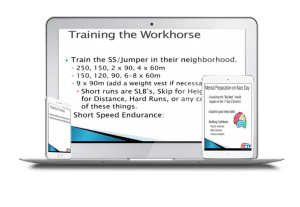 These athletes are better referred to as your “Workhorse Sprinters…” Your multi-talented sprinters who can run the 60 meters through the 400 meters and who might even be able to find success in a field event or on a relay leg. And then there is the combined event athlete who can score points in an individual event and the MultiEvent. Can you think of any athletes on your team who fit this description? 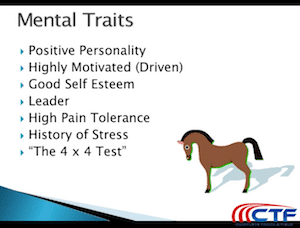 With mental traits, the first thing we have to look for is someone with a positive personality. These student-athletes are going to be working with various event groups so you want to make sure that they are a positive contributor to each event group. You don’t want someone with negative personality traits because then they are carrying all of that negativity, not to just one event group but to every event group they might be training with on a given day or given week or throughout the entire year. We also want to find a highly motivated, highly driven student-athlete. Are they willing to do more work? We also want to find student athletes with good self-esteem. If you do one event you’re probably going to get a lot of constructive criticism from your coach. If you do multiple events you are probably going to get more constructive criticism from your coach. So, we need to have good athletes that understand what constructive criticism is, how to internalize it and stay positive, move forward and learn. We also want to find people who are leaders especially if they are going from event group to event group to train with other people. We want people to lead in the right direction and not the wrong direction. We also want to look for athletes who have a high pain tolerance. They are going to have to do a lot of different types of training and sometimes it’s going to be really hard. So, we want to make sure this is something that they are up for. It is important to take a look at the history of stress for your athletes. The athlete as a “Workhorse Sprinter” will deal with high pressure situations. They are going to be in more events than most, which means they are also going to have more stress and more pressure. And if they are someone that doesn’t do well with stress and pressure, then being a “Workhorse Sprinter” is probably not something they will care for. One of the tests I use is the 4×400 meter relay test. Towards the end of a track meet if you walk up to group of athletes and you ask them to hop on the 4×400 meter relay, if they are the first ones to walk away, they are probably not going to be positive team members with good leadership that are highly motivated and they probably don’t have a high pain tolerance. So, they are not going to be the people that you identify as Workhorses. The ones that jump at the opportunity to do something are the ones that you probably want to focus most of your attention on.